The story of Rocky Patel and Rocky Patel Cigars is a story of “unrivaled persistence” and a perpetual quest for perfection. 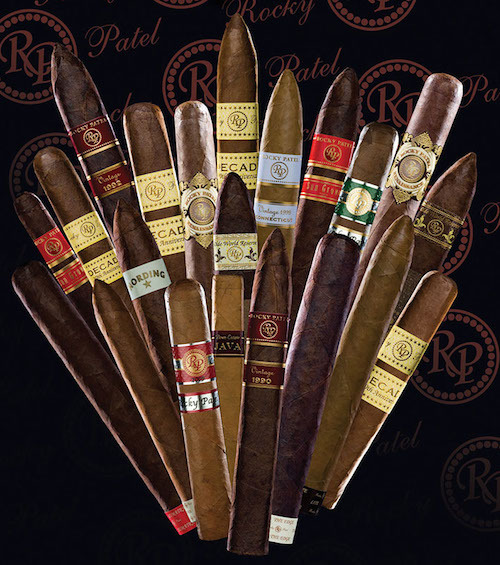 Rocky Patel is not a third-generation or second-generation cigar maker. He is the first generation. Born in India, it was not until Rocky moved to LA and started his career as an Entertainment and Product Liability Lawyer that he was introduced to the cigar world. It did not take long until he was infatuated. Rocky become a founding member of the LA Grand Havana Club and eventually sold his practice to start Indian Tabac Cigar Company in the mid-1990s. The mid-1990s was not an ideal time to start a new cigar company. With new companies popping-up daily and established companies gaining more recognition, the niche was small. But, Rocky had something new in mind. Indian Tabac first gained recognition and notice at the 1996 RTDA by drawing in crowds with fresh ideas, bold packaging and fuller cigars—something that wasn’t done at this time. After solidifying themselves as a company that was here to stay, Rocky and his team turned their attention to perfection. Not one to sit at home, Rocky took to traveling coming up with new ideas during his 300 days a year on the road. After meeting and speaking with consumers and cigar lovers, he began to understand what people wanted. Cigar Aficionado’s yearly Top 25 is the best of the best and the process of selecting the elite is cutthroat, making it one of the most exhaustive tests of cigars in existence. Only by removing all branding elements and through a blind taste test are the winners selected and crowned. Rocky Patel Cigar’s diligence of perfection shows as they grace this elite list not once, but multiple times. The headquarters of Rocky Patel Cigars are based in Bonita Springs Florida while the cigars are produced at the Plascencia factory in El Paraíso, Honduras and the TAVISA factory in Nicaragua. Recently Rocky Patel has started growing his own tobacco in Nicaragua. He also has the fashionable Burns Lounge in Naples, FL and produces popular accessories like cutters, lighters, ashtrays, and etc . In 2015 he launched a line of Briarwood Tobacco pipes based on his long standing association with Erik Nording. Rocky’s persistence and strive for perfection over the years has paid off. With unwavering diligence and passion, Rocky has continued to make some of the best cigars in the industry.